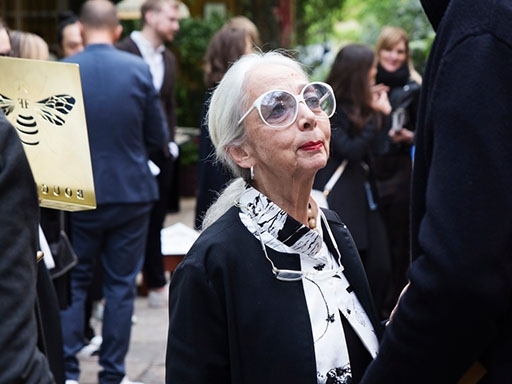 The Galleria Rossana Orlandi is seen as one of the most popular meeting places during the Salone del Mobile in Milan – the world’s most important furniture show. It is in no less illustrious a place than this that we spent one whole day presenting a sample of our expanded product portfolio: the new BIRKENSTOCK beds and sleep systems that have been created in conjunction with our Austrian license partner ADA. The leap from sandal to bed is only logical: “As a brand with a long history, and as the company that invented the footbed, thanks to its functional and orthopedic expertise BIRKENSTOCK has always stood for a healthy gait and stance. In that sense, it obviously makes sense for BIRKENSTOCK to expand from anatomically-shaped footbed to anatomically-shaped beds,” says BIRKENSTOCK CEO, Oliver Reichert. 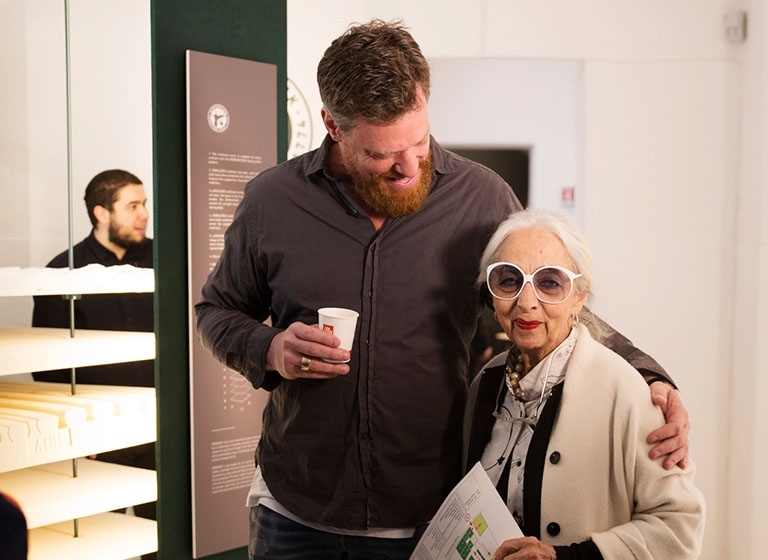 Rossana Orlandi is a real celebrity in Milan: The former fashion designer now runs her own furniture and design store. 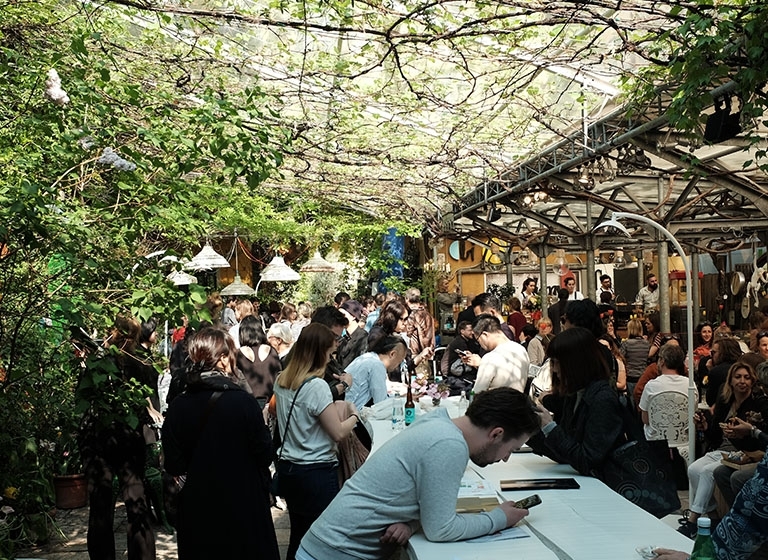 Year in, year out, right on time for the trade fair, she attracts the international design world to her gallery with its romantic, vine-adorned inner courtyard. What makes Rossana Orlandi’s gallery space Il Spazio so special, is its unconventional mix, which revolutionizes the way in which design art is shown. Anyone who wants to see a unique selection of new products in their natural setting comes here sooner or later. For us, the Galleria Rossana Orlandi was the perfect location for presenting our new beds and sleep systems. Our on-site product installation was devised by British editor and creative director, Nick Vinson, known for his monthly column in Wallpaper* magazine. He wrote for the Financial Times and spent years working in the fashion industry where he collaborated with such luminaries as the iconic photographer, Terry Richardson. Nick Vinson staged the elegantly classic IONA box spring bed for us in Milan. This is one of the six box spring and upholstered beds from the new BIRKENSTOCK collection. He personally chose the color of the wooden feet, the textile cover, and the leather details. The set-up and decoration are inspired by the 1970s – and everything has a connection with nature: from the linen bedclothes and the silk pajamas to the jute carpet and handmade woolen blanket – a 1970s original. The second installation in the gallery is reminiscent of a kind of “mattress explosion”: Nick Vinson separated our Helsinki 204 latex mattress into its individual layers – each of which has its own special function. This allowed visitors to see just how functional and innovative the new mattresses are. Thanks to the wave-shaped design of the mattress and the many disc springs that adapt perfectly to the body’s contours, the reality of human anatomy when sleeping and lying down is taken into account more than ever before. 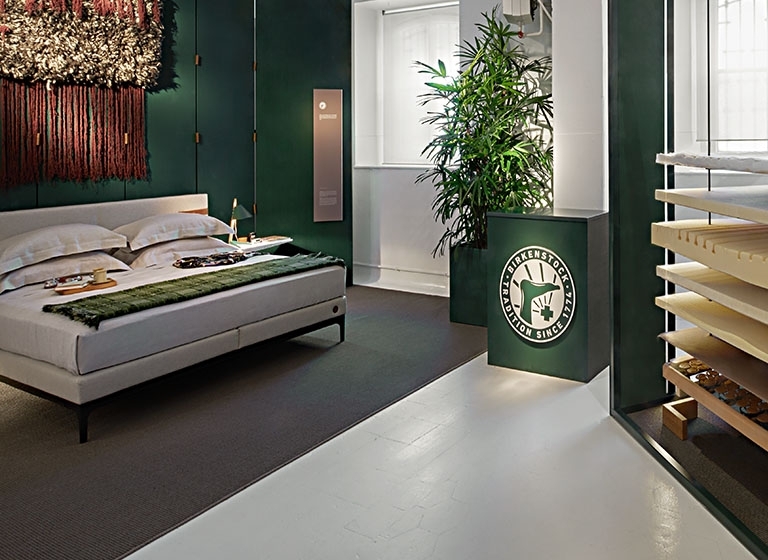 Our start in Milan was a success and the new beds and sleep systems were presented authentically and strikingly at the trade fair and at the Galleria Rossana Orlandi. Mille grazie, Milano!